The Trump administration axed several officials last week, including Secretary of State Rex Tillerson and FBI Deputy Director Andrew McCabe. McCabe, who was set to retire on Sunday, pointed the finger at Trump’s “war on the FBI,” while Attorney General Jeff Sessions insisted the decision was based solely on an internal recommendation to dismiss him. The major indices dropped on Tuesday after news of Tillerson’s firing, which Tillerson himself supposedly found out via Trump’s Twitter account, and markets have yet to factor in the political uncertainty stemming from McCabe’s firing, though S&P futures were down slightly as of Sunday evening. The Geopolitical Risk Index (GRI), a measure of global political risk, has hit its highest level since the 2003 Iraq invasion. The measure’s previous high was in August of 2017, when fears of militarized conflict in the Korean peninsula escalated. While last week saw a White House rocked by dismissals, including the firing of an aide under investigation for financial crimes, several reports indicate that a wider shakeup of White House staff is looming on the horizon, and that Chief of Staff John Kelly and National Security Advisor H.R. McMaster are on the way out. While U.S. equities ignored political turmoil in Washington last year, the dollar took a beating, with the U.S. Dollar Index (DXY) falling over 10% in 2017. Mark Rosenberg, co-founder of the research firm GeoQuant, noted continued turmoil could drag the dollar’s woes through 2018. The University of Michigan’s consumer sentiment index hit a 14-year high this month. The gain in the index was driven by households with incomes in the bottom third of the distribution, who reported better assessments of current economic conditions. The rise in the index mirrors the rise in The Conference Board’s consumer confidence index, which hit an 18-year high in February. The increase in consumer confidence reflects an economy on solid economic foundations, with record-low unemployment, rising wages, and seven and a half years of consecutive job growth. Bitcoin prices tanked last week, with the cryptocurrency falling below $7,800 at one point last week. Although the price recovered and finished above $8,000 to close the week, Bitcoin remains down over 60% from its all-time high in December 2017. At the moment, the cratering of Bitcoin makes forecasts like cryptocurrency commentator James Altucher’s prediction that Bitcoin would soar above $100,000 this year look laughable. The cryptocurrency’s plunge comes amidst confusion over paying taxes on Bitcoin holdings, an impending regulatory crackdown, and the fact that it is falling out of favor among criminals, a key constituency. Russian President Vladimir Putin was elected to another six-year term as president, winning 74% of the vote. Putin’s victory, which comes amidst reports that Russia was behind the poisoning of an ex-spy living in the UK, was marred by voting irregularities, including videos showing officials stuffing ballot boxes, reports of forced voting, and obstruction of observers in many polling locations. Alexei Navalny, the main opposition leader, was barred from the race, and he called on his supporters to boycott the vote. The election is likely to continue the heightened tensions between Russia and the West, though this tension has hardly affected Russian bond purchases in the West. Just last week, investors snapped up $4 billion in Russian bonds as S&P Global upgraded its rating on the 10-year Russian government bond to investment-grade status. Major U.S. benchmarks continued to churn, finishing slightly down. 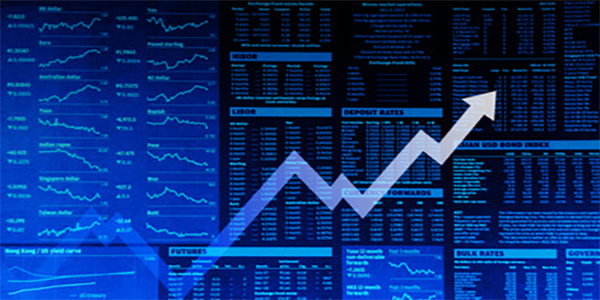 The Dow Jones Industrial Average (DJIA) finished down 1.5% for the week, the Nasdaq Composite (COMP) closed down 1.0%, and the S&P 500 (SPX) finished down 1.2%. European benchmarks fared mildly better than those in the U.S. The UK’s FTSE 100 Index (FTSE) finished down 0.8%, and the German DAX Index (DAX) closed up 0.5%. Asian markets mirrored their U.S. counterparts. Japan’s Nikkei 225 finished down 1.1%. India’s BSE Sensex finished down 1.1% and Hong Kong’s Hang Seng closed up less than 0.1%. Political turmoil in Washington is going to take its toll on markets (eventually). Equities virtually ignored turbulence in the West Wing last year, but that could be different in 2018. While most analysts focused on stocks in 2017, far fewer noted the dollar’s precipitous drop. As mentioned earlier, the dollar fell over 10% last year, and analysts have attributed this to the scandals and turnover that have rocked President Trump’s White House. Mark Rosenberg’s preferred measure of political risk is GeoQuant’s “Mueller Risk Index,” which has steadily climbed since the firing of then FBI Director James Comey. This past Friday marked the first time a member of Trump’s inner circle publicly called for the firing of Special Counsel Robert Mueller, with Trump’s personal lawyer John Dowd calling for an immediate end to the Russia investigation. Trump himself mentioned Mueller by name in his Twitter feed for the first time ever on Saturday. The statements may only be opening shots in the White House’s war with the special counsel, and come at a time when Trump is mulling a complete shakeup of his cabinet and White House staff, with Attorney General Jeff Sessions and Veterans Affairs Secretary David Shulkin potentially on the chopping block. Even if U.S. equities ignore political turbulence the way they did in 2017, they will eventually price in changes due to the falling value of the dollar. The U.S. has traditionally supported a strong-dollar policy, which has benefited multinational corporations with large sales in the U.S., U.S. consumers, and the position of the dollar as the world’s reserve currency. The decline in the dollar’s value, in conjunction with the administration’s tariff proposals, will drive prices for consumers higher in the form of more expensive imports, and will erode the dollar’s strength as a reserve currency, which countries like China, Russia, and Iran have been aiming to do for years. However, these changes aren’t as flashy, so market observers haven’t been paying attention to them as much. That doesn’t mean they aren’t happening, and U.S. stock prices will eventually pay the price for it. Financial transactions between the West and Russia may be the next casualty in the new Cold War. Though the Trump administration has repeatedly sought cooperation with Russia, the United States’ European allies have been far colder towards Putin’s regime. U.K. Prime Minister Theresa May expelled 23 Russian diplomats in response to Russia’s alleged poisoning of former Russian spy Sergei Skripal and his daughter. More significantly, the European Council this month voted to extend sanctions targeting Russian nationals and companies that were implemented in the wake of Russia’s annexation of Crimea. These sanctions may only be the tip of the iceberg. Britain’s opposition leader, Jeremy Corbyn, called for a crackdown on Russian oligarchs who use the U.K. to launder money and avoid taxes, and for Magnitsky-style sanctions on individuals associated with the Putin regime. Sanctions from Europe pack a far greater punch than U.S. sanctions, as the E.U. is Russia’s largest trading partner. With German Chancellor Angela Merkel, the E.U.’s de facto leader, and Putin set to continue at the helm of their respective countries, tensions are unlikely to calm down anytime soon. While sanctions have exacted a toll on the Russian economy and financial markets, demand for Russian bonds remains strong, as evidenced by Russia’s recent sale of bonds to international investors. However, as noted by James Barrineau, co-head of emerging market debt at Schroders Plc., the risk of sanctions targeting Russia’s financial markets remains high, and any such sanctions could roil Russian markets (and to a lesser extent, European ones). Where markets go from here is anyone’s guess. The January predictions of another soaring year for financial markets seem premature in hindsight, as do the February predictions of a market collapse. With markets hovering between their January highs and their February lows, many analysts expect equities markets to churn between these ends of the spectrum for the rest of the year. Even though the bears have mostly gone into hibernation since the recovery in late February, there are a number of catalysts, both positive and negative, in the coming weeks and months that could dictate where markets go. The Federal Reserve is set to hike interest rates for the first time this year on Wednesday, and observers note that Fed Chairman Jerome Powell must walk a tightrope to keep markets calm (which he has shown an inability to do thus far). Additionally, Trump’s steel and aluminum tariffs are set to go into effect, and fears of a trade war have weighed on markets. Trade groups in the U.S. have been furiously lobbying the White House to back off the tariff plan, while many countries have threatened trade retaliation against the U.S. Trump is also said to be planning on enacting heavy import restrictions on China, including indefinite tariffs and investment restrictions. On top of this, inflation has been creeping higher and retail sales have unexpectedly dropped the last two months. Having said this, earnings growth and economic fundamentals generally remain strong. There are a number of uncertainties on the horizon, and these uncertainties could dictate whether markets continue their nine-year run or trend lower.